Fess Parker. Who? Hang with me a minute. You’ll get it. It’ll be a Fess-tival. Many fun Fess-tivities! Oh. I do have a con-Fess-sion to make…I love bad puns. Onward! Fess Elisha Parker Jr., a WWII veteran, actor, real estate developer, and vintner, brought both Daniel Boone and Davy Crockett to life on television and in the movies. And I loved every minute of it. Like a lot of little boys in the late 50’s and early 60’s, I didn’t just like Daniel Boone and Davy Crockett, I wanted to be them. Like a lot fewer little boys of that time period, I was born in Kentucky and lived there, land of Boone and not far from Crockett’s Tennessee. And like even fewer little boys back then I suppose, Fess Parker served as a father figure to me, a kid badly in need of one. Yep, Boone and Crockett, and their embodiment Fess Parker, all really felt like my very own kinfolk. Because of my Kentucky roots, Boone was my favorite. I’ve heard-tell that back in the Boggs line somewhere is a connection to one of ol’ Dan’l’s sisters…real kin. 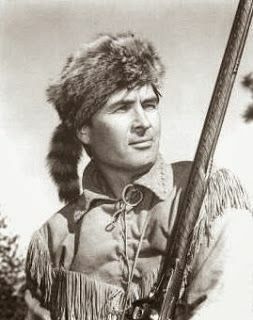 Fess Parker’s Daniel Boone was an American hero. And he was my hero. I longed for a strong, reliable father in my home and had to settle for pretending once a week through the Daniel Boone Sunday-night TV series (running from 1964 to 1970). I can still taste the bologna sandwich. 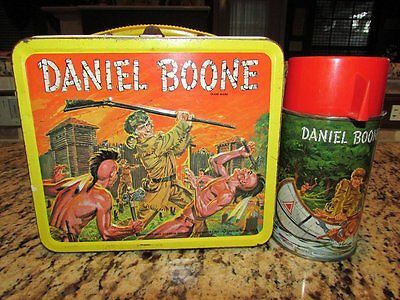 Yep, I ran around in a coonskin cap carrying my Daniel Boone lunch box. An incredible buckskin leather fringed coat was a special Christmas present from my mother when I was nine. 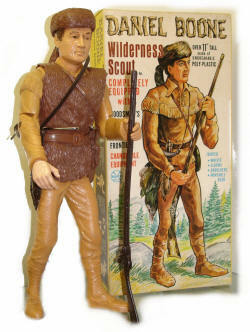 My Marx Daniel Boone 12” tall action figure (certainly no doll!) was one of my most prized possessions as a kiddo and one of the things on a shelf in my home today that continues to make me smile. Fess Parker played a big role in my young life. Because of that, I guess I just thought everybody knew who Fess Parker was. I would have loved to meet him but he died in 2010. I did have the privilege of staying in the hotel/resort he developed in Santa Barbara, California a few weeks ago. There were photographs in the lobby area of Fess with Walt Disney as they worked on the Davy Crockett TV show and movies, plus pictures of the overall Crockett phenomenon. In 1955, for example, some 5,000 coonskin caps were sold every day in the US and you’ll find the original Fess Parker coonskin cap and gear in the Smithsonian. Fess Parker definitely had rock star status back then, yet few people seem to know his name today. As I talked excitedly with friends about my recent stay at the Fess Parker Resort, I was met mostly with blank stares. I was very surprised to find that people (even fellow baby boomers) don’t know Fess Parker. I’m writing to try to change that a little. So set a spell. Take yur shoes off. I got me a hankerin’ to spin us a yarn. Ready for a few fun Fess Facts? Here are some of my favorite tidbits from the biography, “Fess Parker: TV’s Frontier Hero” by William R. Chemerka, Wikipedia, and http://www.fessparker.com. As the Daniel Boone show theme proclaims, “Daniel Boone was a man, yes a big man…” So was Fess Parker at 6-feet, 6-inches. The real Daniel? Only 5-feet, 8-inches, but a powerful enough man to earn the name “Big Turtle” given to him by the Shawnee Indians. In the 1950’s, Walt Disney picked Parker, then a new actor, to play Davy Crockett over James Arness, Buddy Ebsen, and others. Interestingly, Parker and Arness both appeared in “Them!” a classic 1954 science fiction movie about giant irradiated ants. Uh huh. I just watched it…it’s actually not bad. While watching the film to see Arness who had been recommended for the Davy Crockett role, Disney noticed Parker and cast him instead. John Wayne also saw the film and recommended Arness for the role of Marshall Matt Dillon on “Gunsmoke”. So all that turned out okay. And Buddy Ebsen, pre-Jed Clampett, was cast as Davy Crockett’s fictional sidekick, George Russell. Fess also played the father in the classic Disney tear-jerker, “Old Yeller,” appeared in “Hell is For Heroes” and acted in a variety of other movies and TV shows. After Daniel Boone on TV, Fess Parker was sort of typecast as the quintessential American-legend frontier hero. Good and bad, I guess. He was offered the role of “McCloud” later but turned it down (you may remember that cowboy-hick-detective-in-the-big-city TV role went to Dennis Weaver; “thar ye go!”). I think Fess would have been great as McCloud! I liked that show too. Parker retired from acting at age 49. 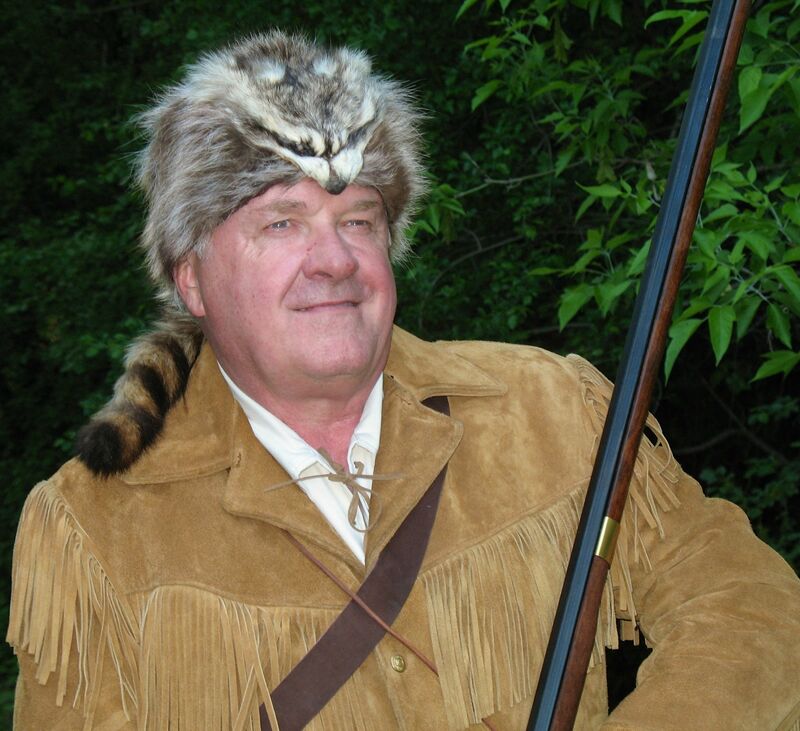 A savvy business guy, his real estate development interests included plans to create “Frontier World,” a Davy Crockett-themed amusement park in Kentucky. Investors lost interest once King’s Island, incidentally a favorite amusement park of my early years, was built in Cincinnati, just a couple of hours away from Parker’s site. Too bad! I would have loved that place! 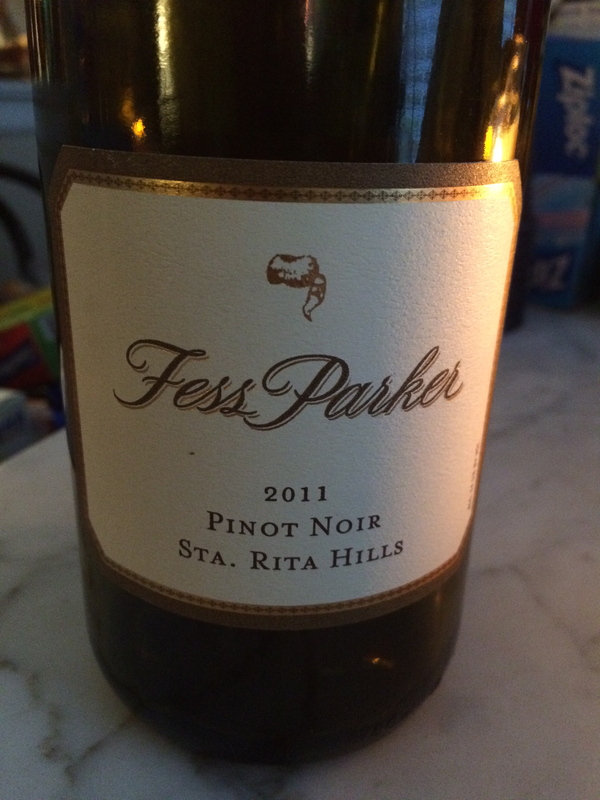 Fess Parker’s award-winning family winery is in the Santa Barbara area. His wine labels still feature a little drawing of a coonskin cap. He embraced his identification with the roles of Crockett and Boone throughout his life. Award-winning wine with the little coonskin cap logo! I’ve been to the Alamo in San Antonio, Texas, the site of Davy Crockett’s death at the hands of the Mexican General Santa Ana. And I’ve visited the re-created Fort Boonesborough in Kentucky. And now I’ve seen the beautiful Fess Parker Hotel. And like trips to those other places, it was like a pilgrimage of sorts for me. Being there caused me to remember bright days of my childhood, days filled with hope and my desire to be something more than I was. Like Fess, I was Daniel Boone, with a strong desire to be what he seemed to be…explorer, adventurer, advocate and defender of the weak, and righter of wrongs. As the TV show theme song went, “what a Boone, what a doer, what a dream-come-a-truer was he!” Hmmm. Maybe that was the beginning of my desire to act…to be more than just me. Whoa, Davy and Dan’l! I’m a-steppin’ in the deep swamp now. Watchin’ out for varmints! Who knows….might find me a big critter I can be fixin’ to grin down for some table meat! Of course, Fess Parker’s Daniel Boone and Davy Crockett were greatly fictionalized versions of these two colorful but very real American frontiersmen. Still, I know enough about the real Daniel Boone to say he was an even grander, more interesting American hero than the legend depicts. Same goes for Davy Crockett, who could have actually ended up as President of the United States. Since I am something of a crazy actor, as a tribute of sorts to Fess Parker, I decided to take a little time to become Daniel Boone. So the latest in the “become my personal childhood hero” series, following Elvis, the Green Hornet and Buffalo Bill, is Fess Parker’s Daniel Boone. Why? Because I can. And it makes me smile. It has been said I don’t do things halfway. That’s a blessing and a curse! So I set out to re-create the classic Fess Parker photograph you see here. Yours truly as Fess Parker as Daniel Boone. 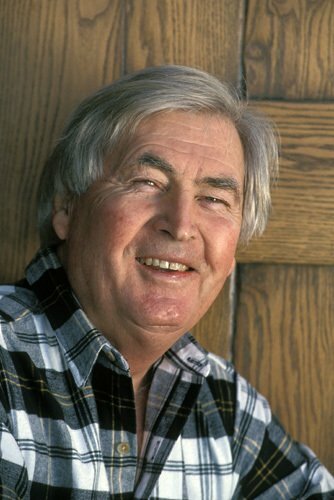 Fess Parker in his later years. Today, I’m eight years old again. Thank you, Fess Parker. “Back in the Boggs line somewhere is a connection to one of ol’ Dan’l’s sisters…real kin.” Do tell! Amazing the universal need for strong father figures in our lives. Mine was Mr. Fred Rogers. Much less of the outdoors person than Davy or Danielle, but filled the same spot in my life. Thanks for the great blog.